We are delighted to announce our project, Leamouth Bridge has won the ACEI award for Design Excellence Civil – Bridges. The ceremony was held Friday 6th April at the Shelbourne Hotel. Leamouth Bridge is a stunning red, long span lifting bridge in London. It was constructed as part of a wider development of the Leamouth Peninsula known as London City Island. 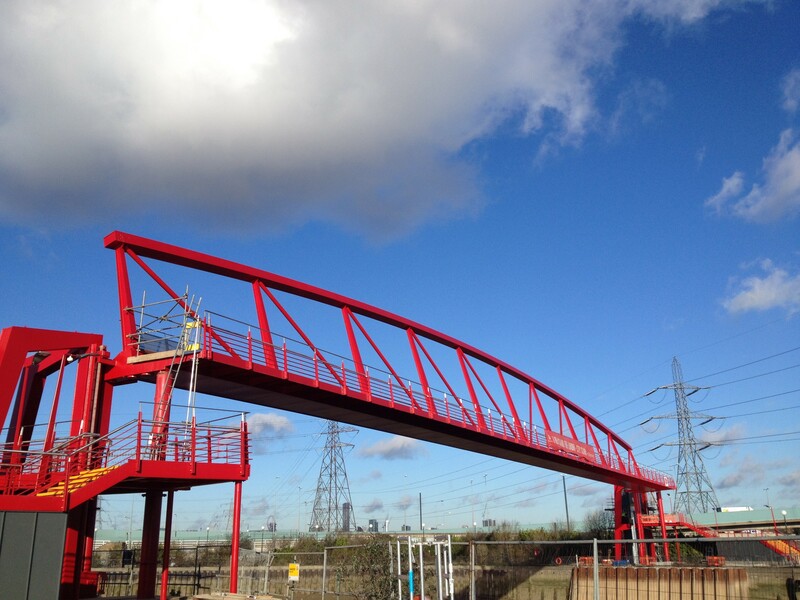 It is a pedestrian and cycle bridge spanning the River Lea between the northern part of the peninsula and land adjacent to Canning Town Railway Station on the opposite river bank. The elevated deck allows the passage of everyday river traffic, however the bridge also has a lifting facility to raise the deck to provide the clearances required by the Port of London Authority (PLA) for occasional taller vessels. O’Connor Sutton Cronin were the bridge designer (Civil, Structural, Mechanical and Electrical) for the detailed design stage as part of the successful Design & Build consortium with John Sisk & Son Ltd.